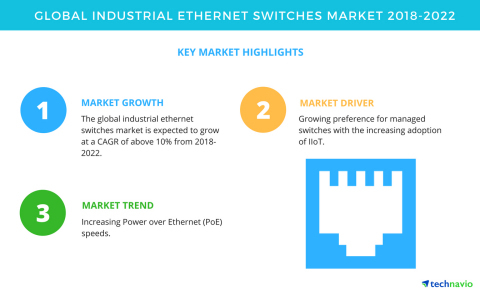 LONDON--(BUSINESS WIRE)--The global industrial Ethernet switches market is expected to grow at a CAGR of above 10% during the period 2018-2022, according to a new market research study by Technavio. The report presents a comprehensive research of the global industrial Ethernet switches market by product, including unmanaged industrial Ethernet switches and managed industrial Ethernet switches. The report also determines the geographic breakdown of the market in terms of detailed analysis and impact, which includes key geographies such as APAC, the Americas, and EMEA. The adoption of IIoT in the process and discrete industries worldwide have increased due to the need to develop a connected working environment. IIoT has features such as easy monitoring and control, reduced downtime, and increased efficiency of manufacturing and production processes. The increasing competition between players in the market and the need to satisfy the diverse need of customers is expected to increase the adoption of IIoT during the forecast period. With the release of 802.3bz protocol, Ethernet switches are set to provide higher data speeds, which will allow users to jump from 1 Gbps to 10 Gbps speed. This will eliminate the expensive recabling cost. At present, the speed achieved with Ethernet is slightly over 1 Gbps and lies in between 1.3 Gbps to 4.6 Gbps. The IEEE802.3bz protocol allows a speed of 2.5 Gbps over the Cat 5e cabling and a speed of 5 Gbps over the Cat 6 cabling. This protocol is compatible with Wave 2 Wi-Fi technology and at the same time offers high physical data transfer rates. The density of connected devices is expected to increase, and so is the preference for Wave 2, due to the increasing implementation of IIoT during the forecast period. In the process industries, there is an increase in adoption of WLAN solutions. They offer installation flexibility and cost advantages to end-users when compared with other networking protocols such as Ethernet. Reduced wiring within industries, extended coverage area, and low installation costs are some of the benefits offered by WLANs when compared to Ethernet protocols. Nevertheless, WLANs do not provide an uninterrupted flow of traffic, and they are not preferred within an industrial environment where magnetic interference is high. Such disadvantages of WLANs have restricted its use for industrial purposes. Celebrate Earth Day and clean energy with Technavio. Get 30% discount on all Energy reports. Offer valid from 12th March - 18th March. The global industrial Ethernet switches market is expected to grow at a CAGR of above 10% during the period 2018-2022, according to Technavio.